The information on this page is for Clark students, staff and faculty. Please read the following information carefully if you plan to bring a car to campus for the upcoming school year. Our 24-hour parking spaces are somewhat limited and therefore decals for spaces are sold on a first-come, first-serve basis. Once the available areas are full, your name will be put on a waiting list and you will be notified if a space becomes available. Please click on each of the links below and review them. For Adobe Reader users, certain forms may be filled out FIRST, and then printed. The Parking Sticker Application form is required for anyone planning to obtain a parking sticker (including commuters). The Out of State Motor Vehicle Form must be filled out for every motor vehicle without a State of Massachusetts license plate that is garaged in Massachusetts. 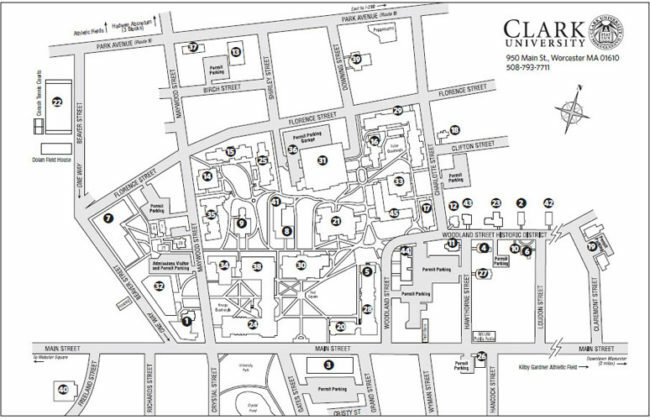 Visitors driving to Clark will find several convenient areas to park while on campus. Parking permits are available from both the Undergraduate and Graduate Admissions offices. For All Emergency Calls between the hours of 4:30 p.m. and 8:30 a.m.